Continuing tradition of more than 50 years! WACO Products - Aluminum and Stainless : slide, weir, screen & stop gates, stop logs and frames, telescopic valves, flap (tide) gates, baffles, stilling boxes, bulkheads, static (manual) bar and wire screens, debris baskets, and related structural fabrications. 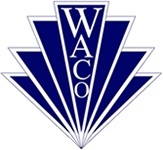 WACO Products, Inc. continues a tradition of more than 50 years of designing and fabricating engineered products and systems for industry and government. Born from expertise in design and construction with structural aluminum, the tradition continues with added capability for all types of high quality custom fabrication. Our Environmental Products help owners and engineers outfit pump stations and treatment plants with long lasting and dependable slide gates, ladders, debris baskets, and similar equipment developed over the past 50 years. We offer standard designs or fabrication to custom specifications.